The ancient city of Salamis stood on the eastern shore of Cyprus, at the mouth of the Pediaios River. It was the island’s most important port city, with ships stopping here from the Middle East and from Europe (particularly the Aegean) in antiquity. 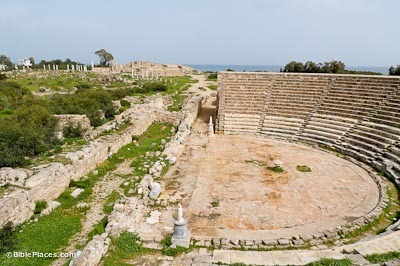 During the Roman period, Salamis was the largest city on the island, surpassing even Paphos, the administrative capital of Cyprus. The city ran along the shore for about a mile (2 km) and reached about half a mile inland (1 km). 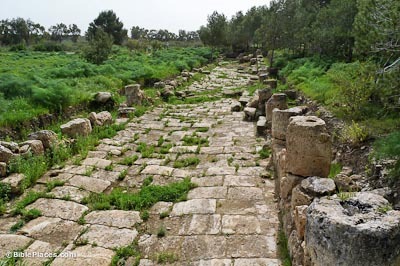 Salamis holds the distinction of being the first stop on Paul’s first missionary journey: “When they arrived at Salamis, [Paul and Barnabas] proclaimed the word of God in the Jewish synagogues. John was with them as their helper” (Acts 13:5, NIV). Both the book of Acts, which refers to plural synagogues, and Josephus indicate that there was a significant Jewish population there. 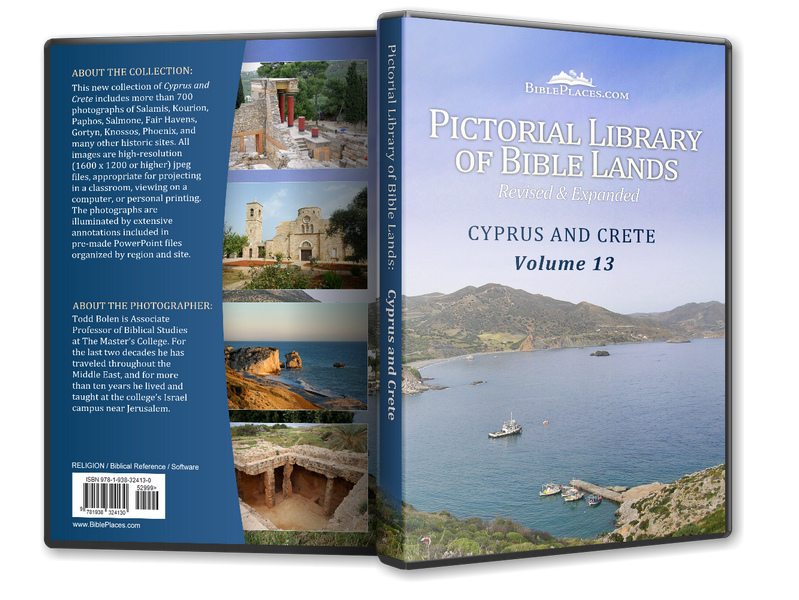 After preaching in Salamis, the missionaries traveled the length of the island on foot, until they reached Paphos. Acts 4:36-37 states that Barnabas, which means “son of encouragement,” was the name given by the apostles to a man named Joseph, a Levite who came from the island of Cyprus. It has also been suggested that John Mark was born on Cyprus since he and Barnabas were cousins (Col. 4:10). The apocryphal Acts of Barnabas records that Barnabas was martyred in Salamis by a mob of Jews that had been stirred up by a man named Barjesus. 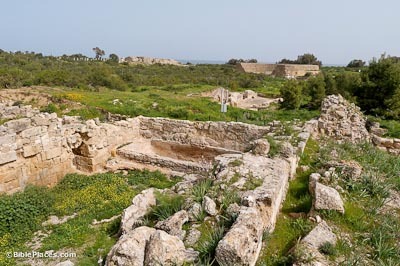 Salamis was founded around 1100 BC by the inhabitants of Enkomi, a Late Bronze Age city on Cyprus, though in Homeric tradition, the city was established by Teucer, one of the Greek princes who fought in the Trojan War. 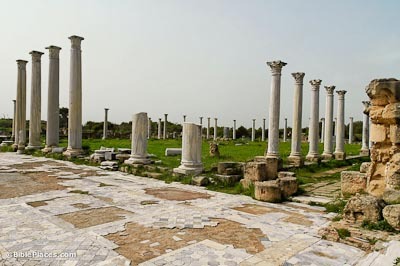 After the Jewish revolt in Judea in AD 66-70, the Jewish population of Salamis increased. In AD 115, however, the Jews of Cyprus revolted against the Romans, leading to severe consequences at the hand of the Roman army under Trajan in 117. Many of the Greek inhabitants were killed (as many as 250,000), and Jews were no longer allowed on the island (Dio Cassius 68.32.2). 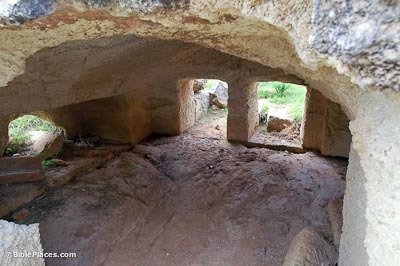 The freestanding, arched tombs date to the 8th to 7th centuries BC. Although probably not all of them were the resting places of royalty, they were at least used by the nobility of the city. (The common people were buried in rock-cut tombs elsewhere.) The tombs were built of mud brick and large ashlars. The horses and chariot used in the funerary procession were sacrificed in front of the tomb, and the dead were buried with jewelry, weapons, and other goods.